The Poncan Theatre has been a cultural pillar in Ponca City’s Historical District for over 90 years. Opening its doors in 1927, this splendid jazz-age venue once showcased cinema’s earliest films and iconic Vaudeville acts. 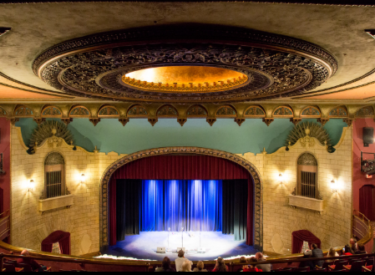 Northern Oklahoma’s “Grand Show Place” still radiates the Art Deco opulence of the roaring ‘20s, regularly featuring stage plays, movie screenings and concerts. Individually listed on the National Register of Historic Places, the Poncan was designed by Kansas City’s Boller Brothers architecture firm in the Spanish Colonial Revival style, complete with terra cotta roof tiles, curved entryways and a symmetrical facade. From the entrance, a sunburst dazzles above Spiraled Corinthian columns, flanking decorative, stained-glass windows. The Poncan’s interior transports visitors to a bygone place and time, with crystal chandeliers, gilt ornamentation, statuary and lavish ceiling art. This decoration style was a primary feature of an “atmospheric theater,” a prevalent movie palace layout in the 1920s that immersed audiences in far-removed settings like European courtyards or tropical gardens. A perfect example is the Poncan’s hand-painted stage curtain which evokes a sunny afternoon in a Mediterranean villa. From the exterior marquee sign to the projection room, The Poncan was a community effort. The original Poncan Theatre Co. owners were active members of Ponca City, including a dentist, two storeowners and a bank owner. The Poncan’s first manager, Fred Pickrel, worked tirelessly to bring in top performers like the John Philip Sousa Band and prominent politicians like Charles Curtis, a Republican Kansas senator who spoke on The Poncan’s stage during his campaign. Such local efforts contributed to the theater’s early success as a premier Kay County venue. On a late summer evening on Sept. 20, 1927, guests swiftly filled The Poncan’s 1,200 seating capacity on opening night. Anyone with 50 cents to $1.10 enjoyed a memorable evening of entertainment. Visitors saw a double feature of the popular short comedy reel Our Gang and Shanghai Bound, Paramount Studio’s 1927 adventure film starring Richard Dix and Mary Brian. Opening night audiences also saw two Vaudeville acts and listened to a solo performance by chief Poncan Theatre organist Vera Byerhoff. Typical of pre-Depression era theaters, The Poncan doubled as a movie theater and venue for live performances until the late 1940s. Entertainers like Will Rogers, actress Ethel Barrymore and burlesque performer Sally Rand graced The Poncan stage. Theater productions were also abundant, as award-winning plays like The Green Pastures and The Firefly captivated audiences in the 1930s and ‘40s. Drawing new generations to the theater in the 1960s, stars like Jay Silverheels (Lone Ranger) and Francis the Talking Mule from the synonymous film series visited The Poncan during movie promotional circuits. Employees brought life to the theater by dressing up in costume to promote The Poncan’s regular rotation of film screenings. With the rise of the Hollywood blockbuster, the theater installed reclining seats on the ground level in 1974 for maximum comfort during these epic films. In the early 1980s, the theater fell into a state of disuse, and after several more years of neglect, closed in 1985. In its nine years of closure, the building was even considered for a parking lot space. With the threat of The Poncan’s demise, local residents organized to save this historical building. Thanks to their efforts in 1990, the theater was brought back to its glory days as an entertainment mecca. Local volunteers lovingly restored the building to its original grandeur over several years. Workers rejuvenated projectors, replaced the carpet with a replication of the original flooring, oversaw contractors and repaired the deteriorated interior with 15 tons of plaster. Volunteers repaired the original stage curtain and found a large collection of hand-painted movie poster art by artist Earl Sturgis, now displayed in the mezzanine lobby. Sturgis was hired in 1937 as The Poncan’s only in-house artist, creating an impressive repertoire of large-scale banners and posters until his retirement in 1955. On Sept. 18, 1994, almost exactly 67 years after the theater’s opening night, The Poncan reemerged in its original splendor, hosting a wide array of concerts, plays, film screenings and other performances. In the late 1990s, The Poncan was a springboard for country music star Blake Shelton during his early days, and still hosts numerous young country and folk musicians. Over the past 20 years, The Poncan has showcased music acts like The Oak Ridge Boys, Kathy Mattea, The Charlie Daniels Band, Leon Russell, Hank Williams III and many more. Guests now can experience The Poncan’s grandeur with year-round performances and events from The Poncan Opry, the free summer Children’s Film Festival, Ponca City Arts and Humanities Council and the Ponca City Concert Series. Visitors can take tours of The Poncan to learn about its lively past, explore archival materials and learn about its current events. In 2017, The Poncan celebrated its 90th birthday, looking forward with resiliency to its next 90 years as a bastion of arts and culture in Oklahoma.